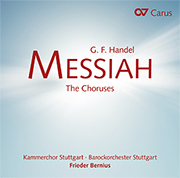 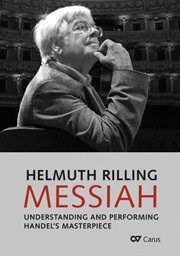 Seldom has a CD recording been so eagerly awaited as the “Messiah” with Frieder Bernius. 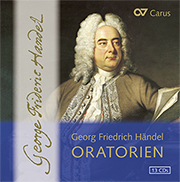 This CD is distinguished both by the special sound and refinement of his ensembles – the Kammerchor and the Barockorchester Stuttgart, which has long enjoyed a outstanding reputation for historically informed performance practice – as well as by the select ensemble of soloists, including Carolyn Sampson, Daniel Taylor, Benjamin Hulett and Peter Harvey. 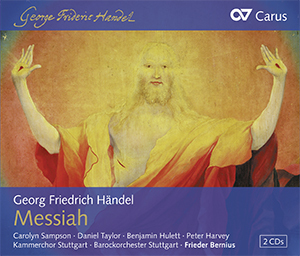 Carus continues its CDs series of works by George Frideric Handel with “Messiah,” his most famous oratorio. 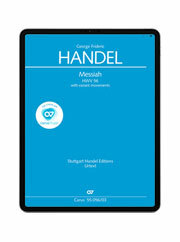 Handel composed the three-part work for the English royal family and gave it its first performance with much success in Dublin in 1742. 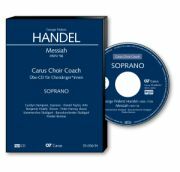 “The sacred oratorio,” as contemporaries called it, combines elements of the English anthem, Italian oratorio, and even German Passion music. 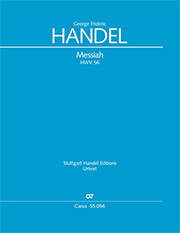 Already during Handel’s lifetime “Messiah” was among his most-often performed works and it achieved virtually cult status.